What are the best exercise machines for weight loss? 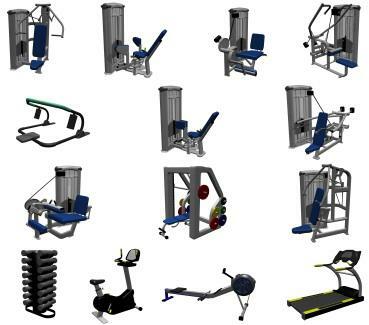 The word "best" is quite subjective, and it is difficult to define which exercise machines are the best. While the definition may be difficult to determine, what matters more than which equipment you use is how you use it. All types of exercise can contribute to weight loss if you combine it with a healthy, calorie-controlled diet. Exercise aids weight loss in a couple of ways. First, exercise burns calories, although not nearly as many calories as people typically estimate. It is very easy to overestimate the calories burned during an exercise session and overcompensate by eating more food than you burned. Exercising but not controlling your caloric intake will not result in weight loss. For this reason, it is essential that you watch your caloric intake if you are exercising to lose weight. Next, strength training exercise can help you to increase your metabolism. As you increase your muscle mass through strength training, your body will require a few more calories to fuel the new muscle. Again, it is important not to overestimate the metabolic effects of increased muscle mass. Don't eat more just because you have gained muscle strength, or you may have difficulty losing weight. Here's the good news. You can turn any exercise equipment into the best exercise machines for weight loss. That's because to some extent, how you use the equipment determines how many calories you burn. In general, exercise equipment that brings more major muscle groups into the action will burn more calories during a session, so an elliptical trainer or a rowing machine may be more effective than a treadmill - but not always. While working more major muscle groups turns up your calorie burning furnace during exercise, so does the intensity at which you exercise. For example, you will burn more calories running on a treadmill at six miles per hour than you will walking on a treadmill at two miles per hour. Likewise, adding slope and resistance to your workout will also increase the intensity. So, an intense treadmill workout may actually burn more calories than a lackadaisical elliptical session. How many major muscle groups does using the machine involve? If it involves more muscle groups, then it will generally burn more calories. This is why elliptical trainers, Nordic Tracks and rowing machines are popular weight loss equipment. Does the equipment allow for varying speed and intensity? The ability to vary the speed, resistance and intensity at which you exercise will give you more options to have a high-intensity, calorie-burning workout. Many pieces of workout equipment have weight loss programs that progressively increase the intensity or vary it. You can use equipment with variable speed, resistance and intensity to perform interval training workouts, which burn calories and strengthen muscles. Is the machine something you will use? If you are purchasing an exercise machine to aid in your weight loss efforts, find a piece of equipment that looks fun and appealing, or you risk having it become an expensive clothes hanger. Exercise machines only help weight loss when you use them. Are there strength training options? Many people associate strength training with weight gain from increased muscle mass, but strength training equipment works well for weight loss. Along with burning calories during your workout, using strength training equipment builds muscle, which results in slight increases in metabolism. While you can turn any exercise machines into weight loss machines, here are a few recommendations that work multiple muscle groups and provide an overall workout. If you're trying to lose weight, then exercise machines can play a significant role if you exercise with intensity and combine your exercise with a healthy diet.